To help create a thorough guide to get you safely into the wild world of Twitter, I spoke with our very own Twitter Heavyweight, the Queen of the Tweet, Hannah McNaughton. Hannah is the Manager of Content Operations at FWM and she initially signed up for a Twitter account as part of a bet. Her husband made the mistake of bragging about how many followers he was getting on Twitter. Hannah didn’t yet have an account, but as a competitive gal—that’s putting it mildly—Hannah did her research, created an account, and quickly attracted twice as many followers as her husband. Winning! And Hannah isn’t just winning on Twitter; her popularity on the social media site has catapulted her bio on the Foster Web Marketing site to the second most visited page. What?! So once again, I get the baseball bat education on another marketing opportunity and the POWER of social media—and specifically, Twitter. I will save you from that beating! The Twitter tips listed below will walk you through exactly how Hannah went from Twitter newbie to Queen of Tweet in a few short months. Whether you’re a doctor, a lawyer or a business owner, I know that this guide will help you not only compete with but beat out your competition. Find your niche. I’m not going to let you in on a single secret until you answer two questions: why do you want to create a Twitter account and what do you want to achieve with your tweets? Keeping the answers to these questions in sharp focus will be absolutely crucial to your success. Each successful Twitter account focuses on one theme. So your theme—your niche—should be something that speaks to your ideal client, patient or customer. Your theme is not Houston Personal Injury Attorney; your theme is hyper-focused. Think dog bite prevention, the rights of pedestrians, or commuter traffic—whatever topic speaks to you and your audience. And when choosing a niche, be sure you choose something that you're passionate about. If you don’t, you’ll quickly grow bored, neglect your Twitter feed and lose followers. Make a name for yourself. It’s important that you choose a solid Twitter handle right off the bat. Followers will come to know you by this name, so you’ll want to refrain from changing very often, if at all. Within the 14 characters you’re allowed to use, try to include: your name, your brand name, or your company name. Which you choose is entirely up to you, and it depends on your focus. If you plan to share both personal and professional information, choosing your name is a good idea. However, if you want to focus in on your brand or your business, choose a handle that includes one of these. Like hashtags, there are no spaces in a Twitter name. 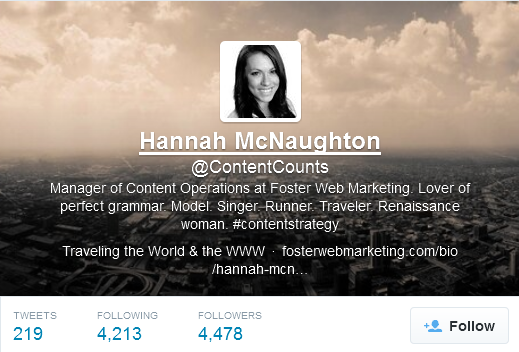 Hannah’s Twitter handle is @ContentCounts, and it’s a good one! It tells users exactly what to expect if they choose to follow her. Choose an avatar. For Twitter success you must choose the right profile picture. Studies have shown that Twitter accounts with a profile picture have 10 times more followers than those without. Your avatar will be displayed with each of your tweets and your followers will come to know you by it, so it's important that you rarely, if ever, change it. The best profile pictures are either a high-quality, tight headshot or your logo. To help you decide whether your avatar should be your picture or your logo, think about who will be tweeting. If you plan to run your account—or hire someone to run it for you—use a headshot. If, on the other hand, the Twitter account represents your firm as a whole, use your logo. Write a bio. Your bio appears under your avatar. It needs to be concise and intriguing. Nobody wants a hard sale here; they want to know what you're about and what they can expect if they choose to follow you. Hannah's bio is a fantastic example. She included her main focus (content and grammar), a few things about herself (thus making her more interesting and relatable), a relevant hashtag, and a link back to her company's website. Just right! Unlike your logo and handle, it’s acceptable to change up your bio as you go. Experiment with what works for you and your followers. Build a background. There are tons of free Twitter backgrounds available to you, but there is something to be said for creating your own. This investment—both time and money—may be worth it as you'll be able to give loads of additional information and appear more professional than your competitors. On Twitter, standing out from the crowd isn’t easy, so a killer background may be just the edge you need. Tweet relevant, resonant content. Without engaging content, you will never achieve Twitter stardom. Your content must advance your image as an expert in your field by speaking about your industry, not the particulars of your business. Hannah follows the 80/20 rule: 80 percent of her tweets are conversational and topical, and 20 percent are about herself or her employer, Foster Web Marketing. In general, Twitter is not the place to announce your latest sale or hawk your wares; it’s the place to build your brand and your reputation as the man in the know. No matter what title you use, try to fit in natural keywords as much as possible. Ask questions. Let's say you're a personal injury lawyer who has decided to dedicate your Twitter account to the traffic in Houston. Instead of commenting on your lengthy commute this morning, ask your audience how their drive on I-45 was. This will engage your followers and make them feel as if they, too, are traffic experts. Retweet. You don’t have to come up with every blog post you link to on Twitter. In fact, you shouldn’t! If someone in your stream wrote an interesting, topical article, retweet it. This will help you solidify relationships with others on Twitter and will show your followers that you pay attention to what they tweet. Leave politics out of it. Unless your niche is politics or religion, follow dinner party etiquette and refrain from discussing politics or religion on Twitter. This also goes for cute stories about your cat and details of what you ate for lunch. You want to stay focused in on your message—your niche—and never stray too far from this core message. Post pictures. Tweets with images perform 150 percent better for retweets, get favorited more often and increase click-through rates. Keep images interesting, topical and shareable for the biggest impact. Pick a hashtag. Choose a keyword phrase, take away the spaces, add a pound sign (#) at the beginning, and you’ve got yourself a hashtag! At the core of every effective hashtag is an effective keyword phrase. To find the keyword phrases and hashtags that will help advance your goals, start with the Google Keyword Planner. This tool will show you where the existing traffic within your niche lies. You don’t need to generate traffic yourself. Instead, divert it your way by using the phrases and hashtags that are already garnering attention. And, when using hashtags, refrain from using more than two hashtags per tweet; any more than that is overwhelming and confusing. Always respond. To increase engagement, respond to every tweet that's sent your way. Yes, every tweet. When responding, thank them for their follow, and use a mention (@ContentCounts) to identify the new follower or commenter. This is good Twitter etiquette and can help you reach an even larger audience if and when the person responds or retweets your response. And don't forget to follow them back! If you don't, they may notice that you don't have the decency to return the favor and unfollow you. But, don't lead with a mention. @ContentCounts can only be seen by those following you and @ContentCounts. Fix this by not leading with a mention or put a period before your @. Timing is everything. To be a Twitter winner, you need to tweet an average of three to five times a day. Yes, a day. Users expect frequent tweets, so give them what they want. Also, it has been said that the heaviest Twitter use is: 9 a.m., noon, 3 p.m., and 6 p.m., so tweeting at these times should yield you better results than tweeting from bed at 11 pm. Keep it fresh. Some people get stuck in a rut; they only speak to their current audience and tend to tweet about the same topics over and over again. Beware of this dangerous rut and work hard to engage potential followers, not just your current audience. If you feel you are out of tweet-worthy ideas, get some input from your staff, spouse or, perhaps best of all, your teenager. Follow Twitter’s rules. Twitter has the right to suspend your account for what they call "aggressive following" and "aggressive follow churn." Aggressive following means following hundreds of random accounts just to get more followers. Aggressive follow churning is repeatedly following then un-following large groups of users. These are seen as spammy, scammy behaviors and you will be punished if you try and use them. Following a person that you’re interested in: In theory, they should follow you back. Easy as that. Choosing favorites: If you click ‘favorite’ on a tweet or two that align with your interests and targeted keywords, the author of the favorited post will hopefully reciprocate, following you and favoriting some of your tweets. Give and receive: It’s perfectly acceptable to offer information, an e-book, or any other free offer to anyone who follows you. Send a message. One good way to get noticed is to send something called an "@message" to top Twitter users. Here's how it works: you can send an "@message" to anyone you want, whether you follow them or not, or they follow you or not. When you post an "@message" it will be posted on your profile page for all to see. So if you wanted to send an "@message" to a news anchor in your town that has a ton of followers, everyone would see that you sent him a message. This could help boost your image as an expert and, if he happens to tweet you back, bring more exposure your way. Spread the word. Once you have the hang of Twitter, start sharing your handle. Put it on your blog, in your email signature, on other social media sites, in your print newsletter, and on your business card. Share, share, share! We hope that this guide to dominating Twitter will help you make the most of every tweet. For help implementing these Twitter best practice tips, or to have us run your Twitter account for you, call 888-886-0939. We’d love to help you become a top Tweeter!